21 years on, how has digital publishing transformed our lives? I am sure every one of us has a story to tell about how digitally published content has affected our lives – be it downloading a recipe, writing a blog, or reading something that’s moved us on our laptop or mobile device. Two events have grabbed my attention this week and made me pause to reflect on the digital publishing revolution. It started for me in the early 1990’s. This week the 43rd London Book Fair cranks into action, and a major component of this event will be the showcasing and discussions around digital publishing. Now, if I claimed to have launched digital publishing and electronic books into the UK 21 years ago, you may pause scrolling on your tablet and exclaim either disbelief or demand me to explain. Well, I can’t take the credit for instigating the digital publishing revolution, but I was responsible for bringing together for the first time the key movers and shakers in the emerging multimedia and electronic publishing movement under one roof, and providing them with a high profile platform where they could collectively speak with the book publishing world at The London International Book Fair (as it was then known) in April 1993. Remember, this was the time before we had access to the Internet and we were blissfully unaware of the worldwide web and home broadband. It was memorable because technologies were evolving out of many separate sectors. The CD-Rom was central to portable storage capability, and technology had reached a point where portable handheld devices could easily be produced, and users could interact with integrated text, sound, images, and video using one piece of kit. This brought together the worlds of IT, video games, audio visual, and entertainment. Content was now the remaining piece of the jigsaw, so the time was ripe to engage with the content owners – book publishers being one of the prime audiences. So in April 1993, Sony lined up with the array of hardware and software developers, and innovative publishing groups to start engaging with the book publishing industry at Olympia. The Sony Data Discman was the forerunner of the e-book reader, and I remember clearly that many dismissed it saying that people would never read a novel through a screen on a portable device. However, this reaction was not a universal response to electronic publishing. Many saw the value and searchable capabilities offered by technology, especially for academic and reference books. Encyclopaedia’s were the first to get the ‘digital treatment’, with Grolier and McGraw Hill’s Multimedia Encyclopedia of Science & Technology leading the way, and were ideally suited to running on PC’s with CD-Rom drives, located in the learning environments of education establishments, and libraries. User interaction with moving content, video, and sound were also deemed useful for learning. The award winning Bun For Barney developed in CDTV format, in conjunction with BBC video was an interactive video game aimed at young children, played on an Amiga computer game device. Philips CD-I player was designed to be used with the TV set and was aimed at the family audience with games and educational software . However, it proved to be shortlived due to its high price point and being unable to keep up with the onslaught from the rapidly evolving games consoles of the likes of Nintendo and Sega. Publishers needed to contend with content moving into multiple media platforms, and therefore the Multimedia Pavilion housing the different technologies and people driving the electronic publishing agenda launched at LIBF, and was equipped to address the many steps needed to publish in the digital formats. With legal firm Simon Olswang providing the full complement of legal expertise covering IP, copyright and advice on the emerging digital landscape, digital publishing had firmly established its presence in the UK at the London International Book Fair. In the UK alone consumers spent £300m on 80m e-books in 2013, representing an increase of 20% year on year in a book market valued at £2bn. 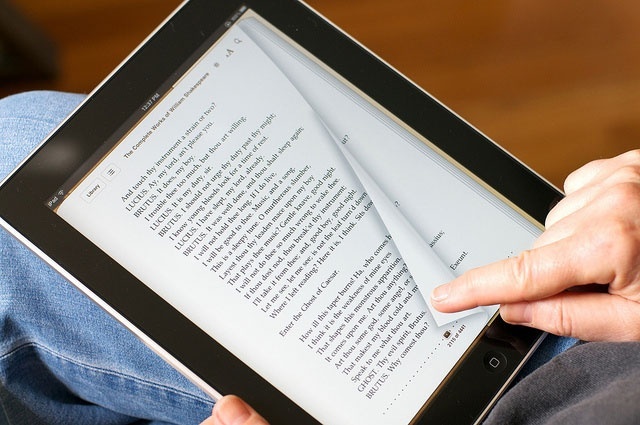 E-books now account for one in four consumer purchases. For the first time in 2013, online sales overtook high street sales in volume. Online retailers had 95% of the e-book market. Ownership of intellectual property persists in a global market where new markets are opening up in territories that were formerly closed, and now involves new publishers and content owners who were not previously used to engaging with publishers outside their national borders. Protecting IP which now has to contend with multiple platforms in a global arena continues to be a key talking point, especially as the recognition of IP and levels of protection vary considerably in different territories. Content. “Who pays for it? How is it accessed?” now occupies the discussion panels. Having seen the music and newspaper/magazine publishing industries respond very differently to the digital revolution as their revenue streams dwindled in the face of free downloading, the book publishing industry is now examining its business models to determine if the Netflix and Spotify type subscription service models are viable. This in turn throws up the issues of who gets paid for what, and impacts upon the industry’s business rationale, shapes how the publishing industry is structured, and determines the types of roles and skill sets professionals need to embrace. It’s at this point I wish London Book Fair a Happy 21st Birthday in digital publishing, and I am pleased to have been a part of setting the wheels in motion back in 1993.